I have been using Adobe’s Lightroom as a primary editing tool probably since LR3. I used to have a workflow that shifted between Photo Mechanic and Nikon’s Capture One Pro, but had to abandon that when Nikon abandoned what I still feel was one of the best RAW developers on the market (terribly slow but still one of the best ways to get the best data out of a Nikon image file). What LR offered though, despite what I still feel is an inferior RAW render from a Nikon, is a particularly effective workflow: A photographer could essentially do everything required in a single application, from ingest through to delivery. 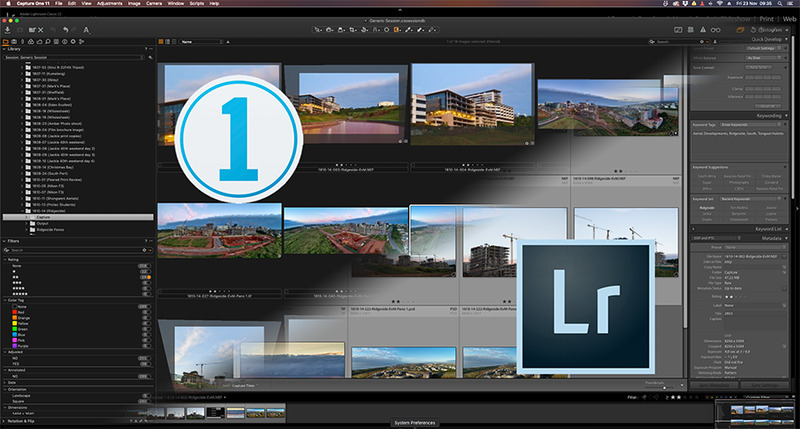 Lightroom to this day remains one of the most holistic applications on the market. Although there are several competitors out there now, LR is still the only standalone application that can ingest with RAW development and metadata presets, have a library that can be searched easily through a variety of tags and metadata, apply those same tags, keywords and metadata, export directly to online services (including photobook creation), edit individual and batch images through a fairly comprehensive set of RAW tools, do fairly advanced pseudo layering of edits including dust spotting and clone work, merge images into a DNG high dynamic range image, merge into a DNG panorama, automatically keyword people’s names, create webpages for clients, have a robust printing workflow, add geotagging data, create slideshows for videos, port images automatically between several capture devices and computers (thanks to the new CC version of the application) presentations and the web as well as have the best ‘round trip’ experience between itself and Photoshop. So why the hell would I want to abandon it? First and foremost, I have never been happy with the way that LR handles the files from my Nikon cameras. 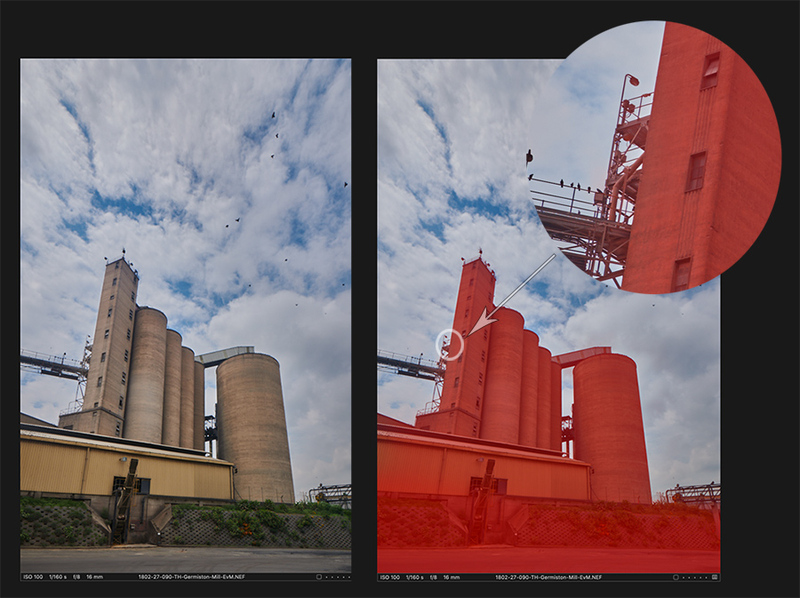 Ultimately I always had to tweak images after ingest despite creating a set of presets that suited my workflow. Using the healing brush was becoming a nightmare. It would cause the machine to slow to a crawl (note, I am working on a Mac Pro computer - aka the ‘trashcan’ - that can supposedly handle 4K footage in Premiere Pro so you’d think it could do some dust spotting). As fantastic as LR is for searching through databases of images, trying to keep it as a library for tens of thousands of images AND a primary editing tool is an exercise in frustration. It would take 15 minutes just to load up in the morning by the time I switched to Capture One. I do a lot of traveling so am regularly jumping between a Macbook Pro and my desktop Mac Pro. 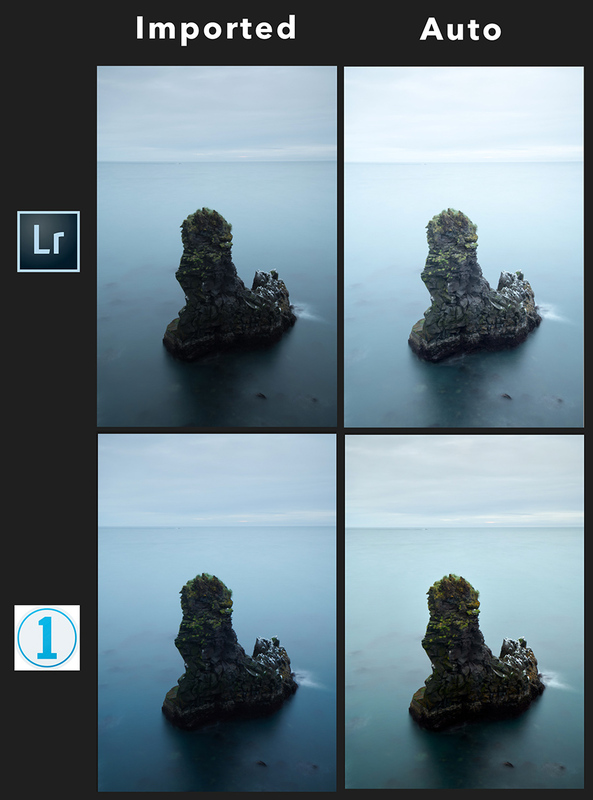 Lightroom requires either saving the .xmp files and reimporting into a catalogue on a different computer or exporting as a catalogue to be merged with another catalogue on a different computer. Either way, a hack (yes, in theory LR has answered this with CC but…see the next point). An over reliance on the internet and a sense that LR and Adobe are chasing subscribers and rent rather than servicing their loyal clients. I live in South Africa. The internet is expensive and not always available. To have to use it to do the heavy lifting of managing files across multiple computers is irksome (as well as slow when you are working with large 40MP+ RAW files). To then have to pay an additional (princely) sum to store those images so that they can be ported in the first place is absolutely galling. Straight out of the application I am happier with the photographs. Essentially if I shoot the image correctly it is possible for me to do nothing other than export to client. I choose to work on the images, but with LR I was forced to work on the images. On that note, ‘auto’ is actually a thing with C1. At least with my images, hitting any of the auto buttons in LR would usually result in appalling results (at least to my eyes). Healing and cloning has it’s quirks with C1, but speed is not one of them. From my experience healing is almost as effective as with full-blown Photoshop (with the unfortunate proviso that you have to have a separate layer whenever you want to shift the orientation of the source point). So although C1 has a way to go before I’d say it is perfect, it is faster and more accurate than LR. C1 allows multiple sessions and catalogues to be open at the same time. This means I can be working on one session, but searching a catalogue in another. In other words, having a vast catalogue doesn’t slow down my using C1 as a primary editing tool. Having said that, LR is still easier to search and C1 needs to catch up a little in this respect. PIEware software has an inherent problem in that images have to be imported and exported from it. C1 gets around this by using what they call sessions. All edits to files are kept in an attached folder along with automatically generated .xmp files. If I am working on a folder in an external hard drive on my Macbook, I can come home plug into the drive to my desktop and continue working without having to export or import anything. Floating between computers has become simplicity in itself. Best of all, I don’t need to pay additional subscription fees to have my RAW images float around in the cloud. As it is I am still trying to figure out how to move images from Adobe’s Creative Cloud in order to free up space. The cloud option, as enticing as it seems, is actually a headache to me. Yes, I want cloud storage, but not for every single RAW file I shoot, only for my finished imagery that will be sent to clients or as part of my online digital archive (I don’t need to spend money in order to store a full RAW file of an accidental shot of my foot). So those were the first ways that C1 made my life easier. Since then, as I have become more acquainted with C1, I have come to appreciate several other aspects of the application. C1 is far closer to a Photoshop clone than LR is. On top of the RAW editing that is standard across RAW editors, C1 offers the closest to a layered editing approach that I have come across (bar Nikon’s old Capture NX2). I really appreciate that I can make quite advanced selections based on colour and create masks from these to apply adjustments locally within an image. On top of that the auto-masking is truly phenomenal, again allowing some images to never even get to Photoshop whereas in the past it would have been an essential part of the workflow. Colour editing or grading is taken to a new level in C1. Apart from the fact that I am usually happy with the colour at base, C1 offers far superior colour editing tools to LR. As mentioned above, you can also use these tools to create masks based on colour and tone and work on them in layers, adding or subtracting with the brush tool if necessary. Although I originally overlooked the sessions approach to editing, it has come to define my workflow. I love that a shoot can be compartmentalised into a session. On top of this I can have multiple sessions open at the same time. Even better, any changes I make in a session are automatically picked up if I use a different generic ‘session’ to access the same images. Instead of using a catalogue I now just use a generic session to work on images. Exporting images is significantly faster than with Lightroom. I find that I can export a batch of 100 high resolution jpegs from RAW or 16 bit Tiff files in about the half the time, if not less than I would have with LR. 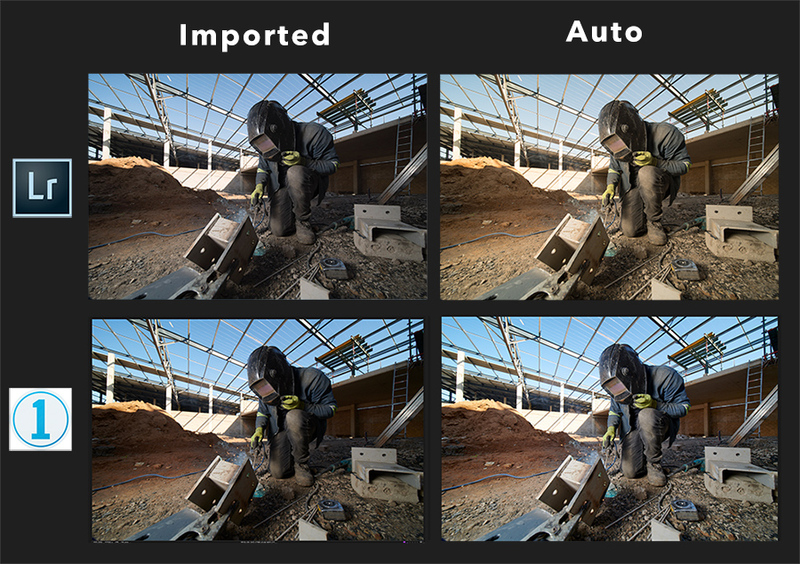 Additionally, C1 has some pretty powerful export settings that enable it to export multiple versions of a file to different locations at the same time (yes, you can do this in LR, but you have to export one set and then go through the procedure again while the first set is exporting). The Curves control is back to being a real curves dialogue. What I particularly like about C1 is that it has a real levels dialogue as well as a real curves dialogue which includes a special ‘luma’ mode which doesn’t affect saturation as you adjust contrast. Add this to the layering ability of C1 and you can get that much more adjusted outside of Photoshop. Working with the Curves and Levels dialogues in C1 is also particulalrly powerful in comparison to LR in my opinion. An added and welcome touch is that all the dialogue can be unlocked and 'floated' over the image as in the example above. I have never really been a fan of tethered shooting while I was working with LR. Now that I am on C1 I find it an increasingly useful tool for certain types of studio product shoots. Where tethering was a headache with LR, it’s extremely simple with C1 (also seems to transfer faster, although I might be wrong on this). There is little to no difference in the round trip experience of C1 and PS. I can open images directly from C1, or have them render from C1 into PS. Then, when I hot save in PS, everything gets updated in C1. Although C1 has a fairly robust printing dialogue, LR has a more intuitive and more fully featured printing module. In LR you can more easily customise the way the images are arranged, create fairly elaborate layouts as well as create jpeg prints of those layouts that can be reimported into LR (Scott Kelby uses this to create interesting page layouts for use in LR’s Book module). As a result I still prefer to print from LR. Searching through thousands of images is possible with C1, but not as easy to set up as with LR. Yes, LR has become abominably slow (theoretically cured by the recent spate of updates…except NOT), but it is still the most effective DAM (Digital Asset Management) tool for accessing archived images. As a result, I still use LR, but not for editing. Instead finished images are imported into LR so that I have an easily searchable (and printable) archive for my completed client and personal work. LR has merged to panorama baked in. For a while in fact it was almost as if the merge to panorama feature was better in LR than in PS. That seems to not be the case anymore, but LR still offers a DNG file as the output panorama, meaning RAW edits are still possible. 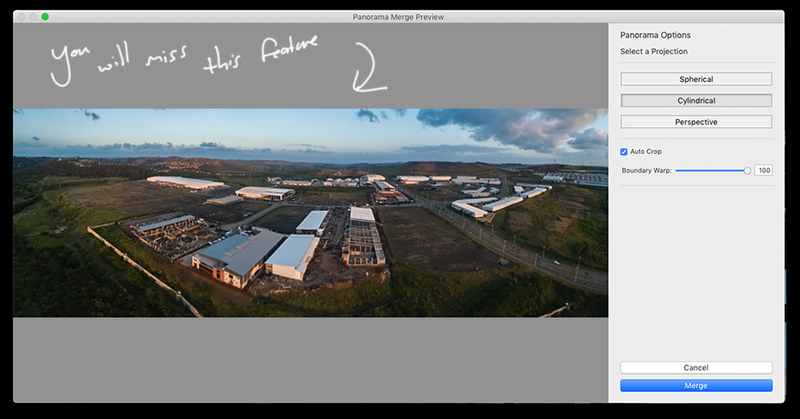 If you do a lot panorama work, not having this feature could be a dealbreaker with any other software options. If you do timelapse, you probably have LRTimelapse (if you don’t you should) on your computer. Unfortunately LRTimelapse does not work with C1 (yet), so I still have another reason to hang on to my LR subscription. Ultimately, photographers have to choose the tools that work best for them. I am not enough of a fanboy to say that C1 is perfect and that I’ll never use LR again. Possibly Adobe will address some of the aspects of LR that bugged me and I’ll find myself reconsidering my use of it. On the other hand, C1 will probably also continue to improve. Right now, C1 is the right tool for me. The awesome thing is that LR comes bundled with PS on Adobe’s Photography subscription plan, so ultimately I still have access to LR should I need it for some things. 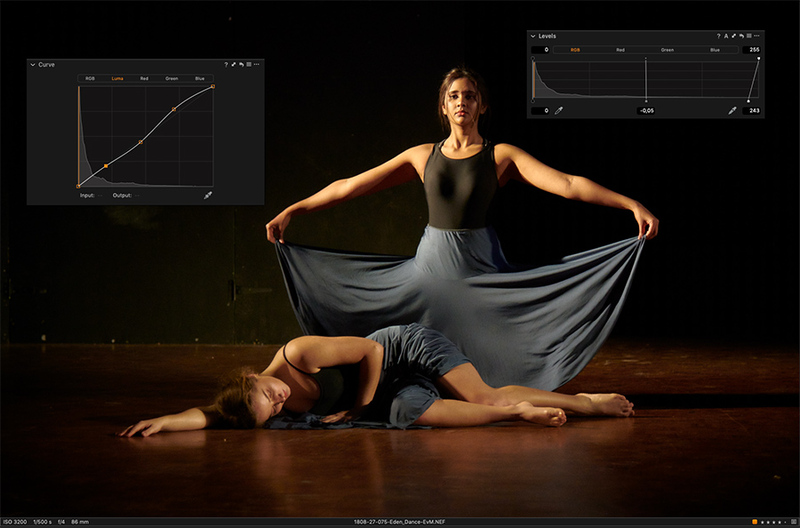 LR is still the software that I tend to recommend to photographers starting out as well. For a beginner it is probably more intuitive than C1, and when you start to look at pricing, is actually cheaper since the subscription includes PS (which I consider essential if you are going to do any serious editing). However, if C1 (or another app) can give me a better search function for my archive, and C1 adds panoramic merging, then I suspect I would happily put LR behind and not miss it for a second.